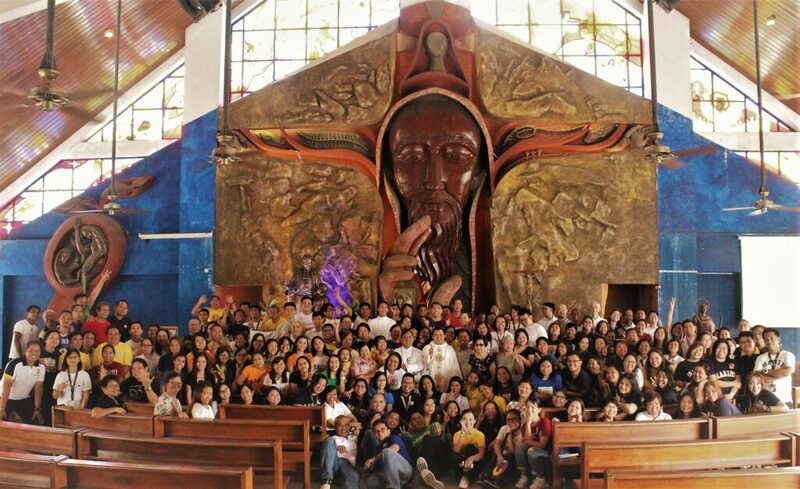 As one family, the Marist School community commemorated the 178th death anniversary of St. Marcellin Champagnat last June 6, with the theme, “Journeying together as One Global Family”. Marist Brothers and lay Marists of Champagnat, including a number of retired personnel and alumni, gathered at the Chapel of the Magnificat to start the celebration with a 30-minute centering prayer, a contemplative prayer session that draws out the prayerful nature centered on silence and meditation as inspired by Mother Mary, a woman of contemplation. 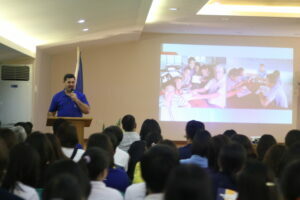 Part of the day’s activities was the gathering of all school personnel to listen to the sharing of Br. John Matthew Hazelman, FMS, Director of Marist Asia Pacific Center, on the life and mission of Champagnat, and the reflections of some pilgrims who visited significant places in the life of St. Marcellin in France in 2017. Br. 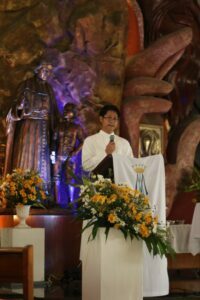 Niño Pizarro, FMS, Marist School President, in his opening remarks during the program, expressed his gratefulness to the gift of St. Marcellin Champagnat; and to his gift to the Church and to all Marists of Champagnat all over the world who committed and share to his mission to educate and love the young especially the least favored. Br. Niño highlighted his message by echoing the reminder of Br. Ernesto Sanchez, FMS, Marist Brothers Superior General to “rediscover Jesus’ attentive eyes and compassionate heart” to be able to be more quick to notice those children who are sick, destitute and suffering, especially those little ones who are in need of our loving presence. He also enunciated Br. 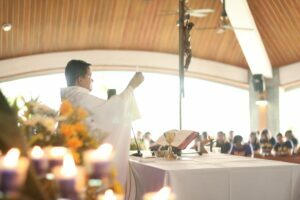 Ernesto’s call for all Marists of Champagnat to attend and respond quickly to the vulnerabilities of the young who, despite their positive characteristics, might fall to self-centeredness and indifference in this globalization and digital era. He said that the feast of St. Marcellin Champagnat is a good time to inspire all Marists of Champagnat to renew and strengthen their commitment to Marcellin’s dream as rekindled in the recent 22nd General Chapter of the Marist Institute (www.champagnat.org). Br. John Matthew Hazelman, FMS shared about the life and mission of St. Marcellin and focused on the call of the Brothers to “become living witnesses among the children and young people” and to live out their vocation based on the true spirit of communion, spirituality and mission”. For the Lay Marists, Br. John emphasized on vitality of having a deep sense of spirituality rooted on the shared life and commitment to mission. He reminded the community about the responsibility that lay mission partners hold in further recognizing and supporting the distinctive vocational paths of Marists. He stressed also that everyone is called to become beacons of hope, to be the face and hand of God’s tender mercy, to be bridge-builders, to journey with children and the young people living in the margins of life, and to respond boldly to the emerging needs of the community. The Champagnat Day celebration was capped by the sharing of some pilgrims about their experiences in visiting the significant places in the life of St. Marcellin Champagnat and the early Brothers in France. The pilgrims were one in saying that the pilgrimage helped them to understand better and see more deeply St. Marcelin’s life, charism and mission, the same charism and mission that they live and share as Marists of Champagnat.